The minimum wage rate is one of the polarizing points between Democrats and Republicans. Both parties point to studies claiming that raising the minimum wage will either increase inflation, negating the benefits, or it will lead to stronger purchasing power among the poorest consumers, improving the economy. Both sides make strong points. 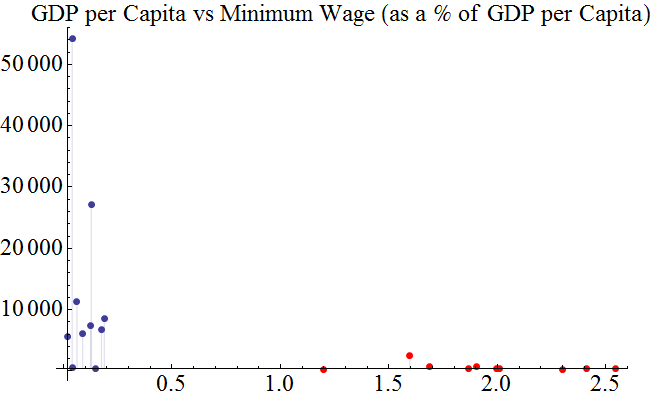 And into this confusing fray, I throw my own little study about the worldwide minimum wage. So you don’t have to slog all the way to the end of my blog post, the conclusion was this: examining international economies introduced many more variables into the analysis that we don’t have to worry about in the USA, notably the role of foreign aid. I think the only real conclusion I could make was that giving foreign aid to an impoverished nation does not drive up inflation. Looking at international values for the minimum wage, Uganda’s 1¢/hr stood out as shockingly low. In fact, there are 72 countries with a minimum wage under $1. At some point I realized that it might be a good idea to normalize the wages to something. GDP per capita perhaps? The GDP per capita is the value of goods and services produced in the country, divided by the population. Let’s call that “average wealth per person” since that seems to be how the metric is interpreted. Uganda’s average wealth per person is about $500. So Uganda’s minimum wage of a penny/hr translates into an annual income of about 5% of the average wealth. For a reference, the USA minimum wage is about 29% of the average wealth. And w-a-a-a-y on the opposite end of the spectrum we find Mozambique and 20 other nations with minimum wages that exceed their nations’ average wealth per person! Mozambique’s minimum wage is set at 51¢/hr and the average wealth is about $440. The minimum wage works out to be 241% of the average wealth. How does this make sense? Last year, Mozambique received about $2.75 billion of international aid, and presumably this seeped into the economy to make up the gap. Hmmmm… Both ends of the spectrum represent poor nations, but perhaps they are good subjects to look at for the whole inflation vs. financial empowerment debate. Let’s take the bottom 10 nations (the lowest minimum wages as a % of average wealth) vs. the top 10 (where the minimum wage exceeds the average wealth). So what did this prove? I guess it shows that foreign aid to impoverished countries doesn’t (necessarily) drive up inflation. 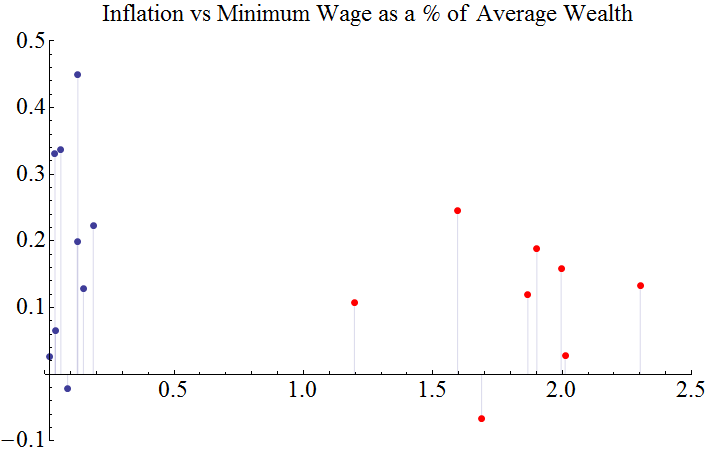 Along those lines, raising the minimum wage in those countries doesn’t seem to be correlated with inflation. I’m not sure this worldwide trend applies to the current debate in the United States since economic conditions are so different here. This conclusion is certainly not what I was aiming for, but was still an informative result to the project! Just to finish up, along the way I learned some other interesting facts. Many countries have no minimum wage. Somehow I’d assumed that all first world countries had a minimum wage. But Germany only just approved a minimum wage yesterday (7/3/2014). The amount is $11.50/hr, but the full law doesn’t kick in until 2017. Other first world countries with no legally mandated minimum wage: Austria, Denmark, Finland, Iceland, Italy, Norway, Sweden and Switzerland. These countries depend on essentially union-lead negotiations to set their wages. The effective minimum wage seems to be anywhere from $10/hr (Germany, the day before yesterday) to $20/hr (Denmark).